Here is a serious offshore passage maker. She is designed for a couple to handle but has generous accommodations for family and friends. 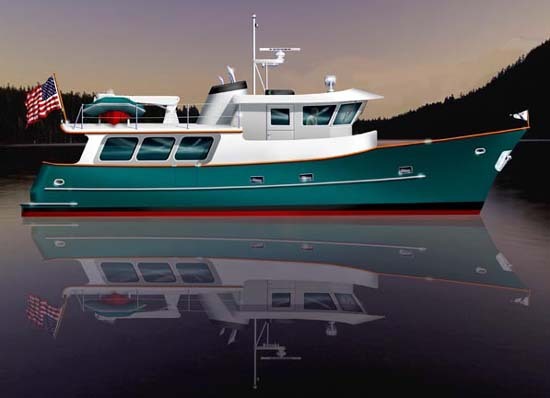 Her hull has space for the comforts of home that are welcome on a long ocean passage. She is an ideal size to cruise the world under power. Fin stabilizers provide the steady ride in the roughest conditions. She has a low profile so as not to be blown around like other floating condos. Her hull is deep enough to provide easy motions, and shallow enough to enter many areas where yachts of this size are limited. Construction is steel to exceed ABS requirements for offshore yachts. NEW! Frame parts drawing for CNC cutting. Call for pricing. Purchase and Download Study Plans for the OFFSHORE 58 for $5.00 in PDF format (zipped file). Purchase Construction Plans for the OFFSHORE 58 for $6,300.00 for delivery by US Postal Service.